Today we will visit the Hassan II Mosque before departing to Rabat. 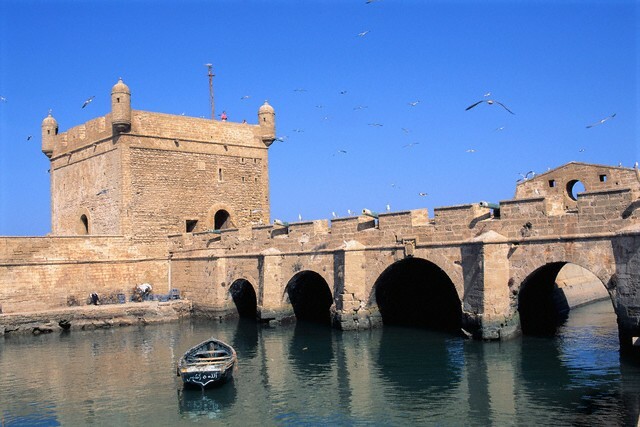 In Rabat you can visit the Mechouar of the Royal Palace, the ruins of Chellah, the Mohammed V Mausoleum and the Hassan Tower. After lunch we will depart to Meknes to arrive in the early evening. After breakfast we will take a tour of Meknes including El Hdim square, Bab El Mansour, the massive gate which is the entrance to the old city and the Jewish quarter, the Royal Granaries & the city rampart. We will then depart via Volubilis, the Roman ruins and Moulay Idriss, the holy town. We will continue onto Fes. Dinner and accommodation at a traditional riad.9 Days Tour to Merzouga from Casablanca, Morocco Tours Excursions, Tours from Casablanca, Casablanca Excursions, Casablanca Day tours, 4×4 tours Morocco. You will have a guided tour to discover the medina and the famous souks of Fes – its narrow streets are filled with ancient mosques and minarets. We will visit the most beautiful palaces and monuments of Fez and our guided tour will include a visit to the tannery and the ceramic cooperative to see traditional Moroccan crafts. Today we will depart for Merzouga through the Middle Atlas region. We will drive through Ifrane, the ‘Switzerland’ of Morocco and the cedar forests of Azrou where we can stop to hand feed the monkeys. We will continue to Midelt where we will have lunch. We will then follow the Ziz River through the valley and stop to see the Ziz Gorges on our way to Merzouga. Today we will explore the desert region and the marvel that is the Erg Chebbi desert dunes. We will make a circuit of the desert dunes where you will have the opportunity to see the nomad’s way of life and the amazing changing contrasts of the desert. We will visit the ‘black village’ of Khamlia to see the Gnawa musicians. We will have a traditional Berber pizza for lunch. In the afternoon we will ride the camels to watch the sunset over the dunes and spend the night in the desert camp. We will have a traditional tagine dinner, and we listen to traditional Berber music. We will wake up early to see the spectacular sunrise over the dunes before making our way back to the hotel for breakfast and a shower. We will viti Rissani market and cross the palm lined valleys of Tourog and Tinjdad to arrive at the Todra Gorge. We will take a walk in the Todra Gorges and have lunch in a local restaurant before continuing to the Dades Gorge where we stay overnight in local hotel. We will spend the morning at leisure for shopping or relaxing in Marrakech before leaving mid afternoon to arrive in Casablanca by 4 pm. That will be end of Morocco tour.